"Why are sweet potatoes and bananas great first foods to start with but corn and cauliflower are not?" "Why shouldn’t we add herbs and spices right away?" The foods that you choose to offer your baby as you introduce solids in the first weeks should be nutrient dense, single ingredient only, unseasoned, and easy to digest and swallow. Many parents choose to jump right in and offer their babies first foods that contain spices and herbs and their babies do well. If you are a nursing mom, your baby may already be used to flavors as the flavors of some of the foods you eat can pass through breast milk (how cool is that?!). Be sure to discuss introducing solids with your pediatrician. To understand why it might be best to start with single ingredients, think about the “food” that baby has been eating from birth to six months of age. Baby has been eating nothing but a liquid diet of formula and/or breast milk. His digestive system is still sensitive and used to processing only these liquids. Imagine how your baby’s digestive system would react if his first meal of solid foods was a seasoned mix of a veggie, a meat, and a starch. It might be difficult to process all of those different foods at once. Your little one would likely have terrible digestive issues and bowel troubles. In addition to possible digestive upsets, you would have no idea about any food sensitivities or allergies. **These foods are great starter foods but are not the only foods that a Stage One baby may eat. Why Start Baby With Single Ingredient Foods and Meals? Single ingredients may not seem exciting, but this doesn’t mean your baby will be eating bland and boring foods. Remember, your baby has no notion of bland and boring at this stage. 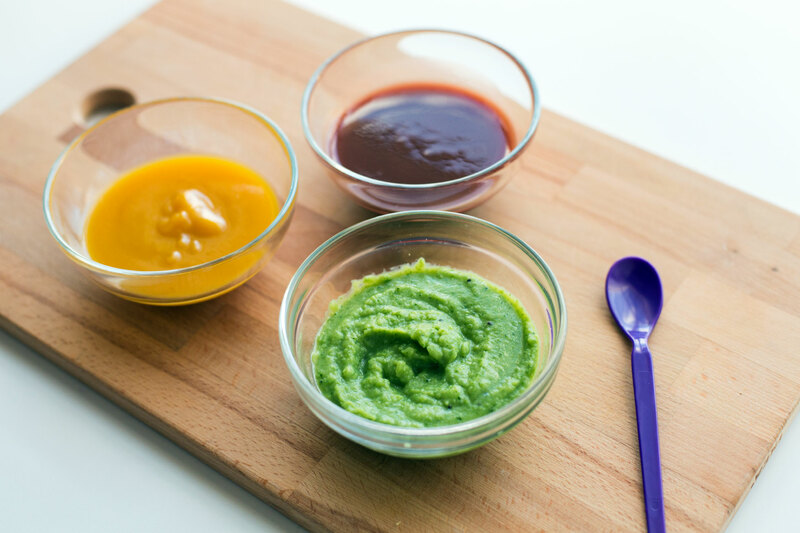 While you may think that a meal of pureed carrots isn’t exciting, your baby’s clean palate and taste buds will be delighted with the new taste of carrots and with every new taste and texture that comes on a spoon or is plopped on a tray. It’s also important to have kids become accustomed to individual flavors so that they will learn to love each food as it is, in all its delicious and healthy glory. Soon you'll be able to also introduce herbs and spices to up the flavor profile! These types of meals are best for your baby's tummy when you first begin introducing solid foods. Don't worry, the transition will be quick and soon enough your baby will be eating combinations and full meals! Once your baby has had a few single-ingredient meals, then you can start to combine and mix those foods together to create new flavors and textures and begin to add herbs and spices. This initial “stage one” experience will be far from bland and boring, you’ll see! By sticking to single-ingredient meals and waiting three to four days before introducing each new food, you’ll be able to more easily identify the cause of allergic or digestive reactions to a food. Always consult with your baby's pediatrician about starting solid foods and other health issues; not all babies will be starting solid foods or eating the same foods at the same time.